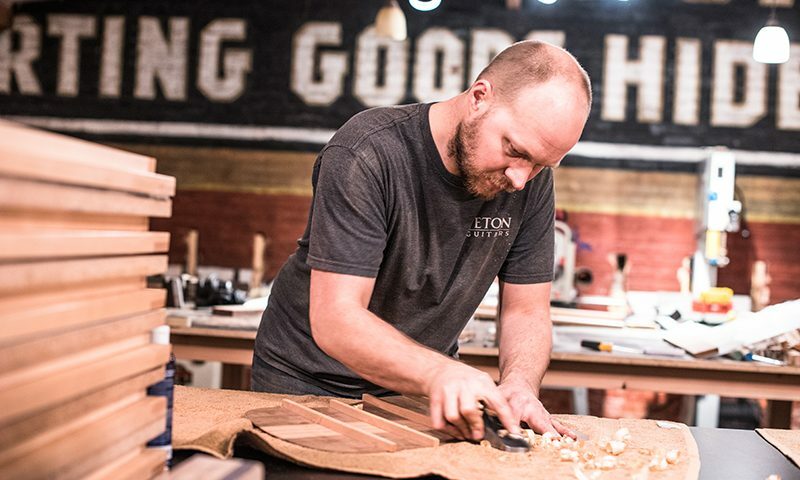 The Handmade Tale of The Great Salt Lake Guitar Co. Tags: Reo Stika, The Great Salt Guitar Co. Through the tall windows of The Great Salt Lake Guitar Co. (GSLGC), I saw owner Reo Stika repairing guitars behind a workbench. The shop, which specializes in handmade guitars, was a welcoming refuge from the cold night, with warm lighting and a long corridor of exposed brick and perfectly mounted acoustic guitars. Ken Stika, the original owner of GSLGC and father to Reo, was a utility and navy man “who always thought people just needed to toughen up,” says Reo. Ken began building dulcimers in 1979 following an injury on an Alaskan crab boat, but found a passion for building guitars in 1981. When Ken opened shop in 1985, he began selling other brands of guitars alongside his custom-made instruments, the first brand being Taylor Guitars. Now, GSLGC sells more Teton guitars than does Amazon, says Reo. In 1988, Ken bought the 80-year-old Center Street building in Provo from Bee Hardware, the only other business to ever occupy the building. Reo bought the business from his father about two years ago—Ken refused to sell to anyone else. “These buildings are lifelong projects,” says Reo. “I’ve been working on this building since I was 8 years old. I love this building.” The main focus of the shop is the same, and after Reo remodeled the space, he saw a spike in business. Unfortunately, Ken passed before Reo began the remodel, but Jan from Bee Hardware “stopped in [the shop] a couple weeks ago,” says Reo. “He got teary-eyed, seeing what this place has turned into.” Jan was so excited that he started telling old stories, like how “the town sheriff was standing here drunk, and his gun fired and almost shot his foot off.” Reo pulls back the rug, exposing a rugged bullet hole in the dark, antiqued hardwood floor. Throughout his life, Reo was often ordered into the shop by his father to do chores as a form of punishment. Ken was a “tough boss,” but collaborated with Reo on the first guitar he built and taught him necessary skillsets. “It gave me a foundation of knowledge and experience that may have taken me 12 or 15 years to learn if I were floundering around on my own,” says Reo. Constantly immersed in the shop, Reo started doing simple string changes when he was 9 years old and actual repairs when he was 14. Reo is less interested in becoming a household name and is more invested in the relationships formed from selling handmade guitars. His own relationship with guitars and music has transitioned over the years. “Half of the life lessons I’ve had have come from music,” says Reo, especially during his “angsty teenage years,” when he used music as a therapeutic outlet. Nowadays, he enjoys providing others with the same outlet through building and repairing guitars. Even if their experience is different, “at least they’ll have the opportunity,” says Reo. Reo’s dedication to the craft of guitar building is well noticed in the community. He has partnered with BYU, which sends students exclusively to GSLGC for setups, repairs and textbooks. 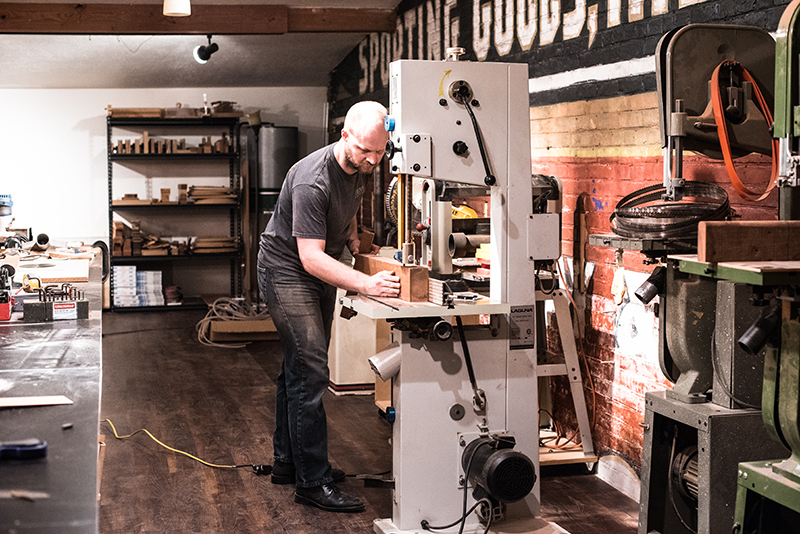 In the future, Reo wants to offer guitar-building classes and a concert series in the shop, which offers a large room with no parallel surfaces—great for acoustics and no harsh reverb. 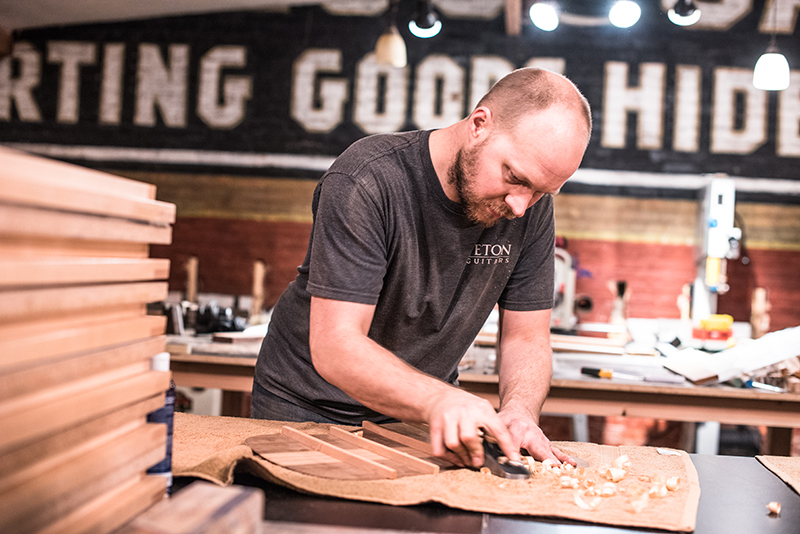 Reo enjoys passing on the principles of craftsmanship, as his father did, to his 4-year-old son, Elliot. Ken once told Reo, “You will never achieve perfection. But it’s your job as a craftsman to do the very best that you’re capable of.” Elliot gets exposed to that, too, says Reo. 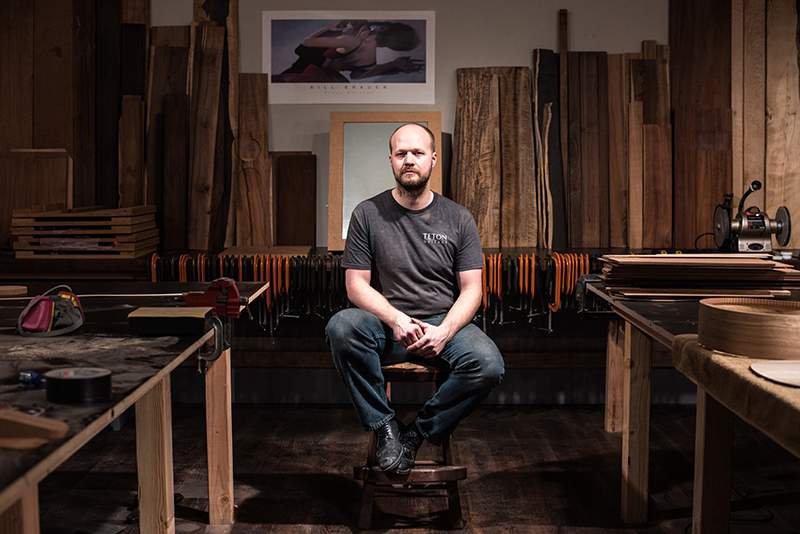 Just by smelling wood, “Elliot can tell you the difference between East Indian rosewood and Brazilian rosewood,” Reo smiles. “I’m able to bring Elliot down here, and that’s just a luxury other people don’t have.” Reo feels that his best memories are being made now, through the opportunity to use history to adapt and create a thriving future for GSLGC. Editor’s Note: The original version of this article misquoted Reo Stika. GSLGC sells more Teton Guitars than does Amazon. The amendments have been made online.